Here’s what I chose to do for the necklace. I used chain, twisted wire and sari ribbon for my pendant! Excellent choice of colors and a very interesting use of chain and sari ribbon. Great design! Oh I like how you finished it! The twisted wire and chain were a creative way to compliment the ribbon. Really a great design. Love how you continued the wire wrapping in g the neck strap. The sari silk is a great choice! The sari ribbon goes great with the birds. Real birds would probably like it for nest making. Oooohhhh … aaaahhhhh! Gorgeous Robin, really gorgeous. It looks great! 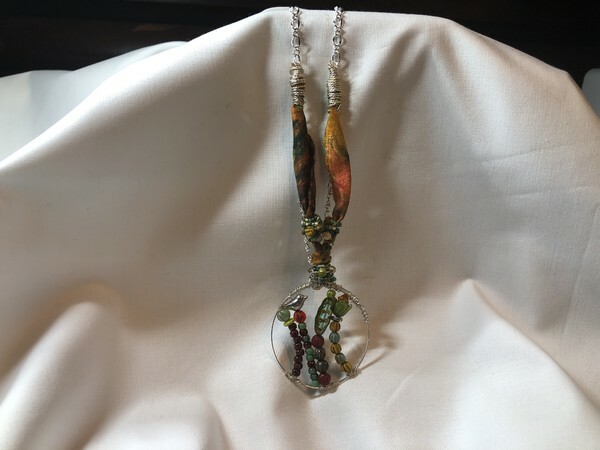 The sari silk and the chain are perfect for your pendant. Brilliant! The sari ribbon wire wrapped is perfect for the pendant. Couldn’t have turned out nicer!